I think there should be “cupcake food groups” like the regular food pyramid food groups. I mean, I already include chocolate as a food group in my diet so it may as well become official. 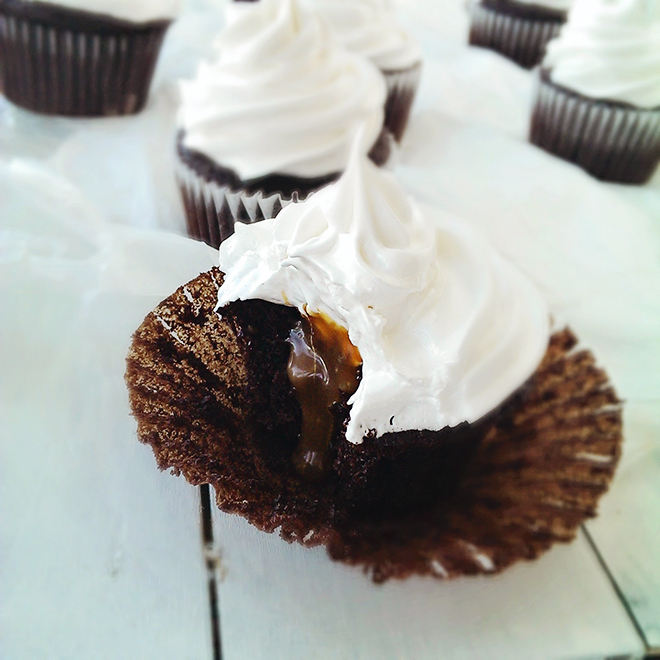 Foodess combined a dark chocolate cupcake with a caramel filling and a marshmallow frosting which means these cupcakes include at least three of my favorite cupcake food groups. See how much better that sounds? Remove bowl from mixer, and pour batter into a large liquid measuring cup with a spout. Divide batter among prepared muffin cups, filling each no more than two-thirds full (or else batter will rise over and make a big mess – not bigger cupcakes). 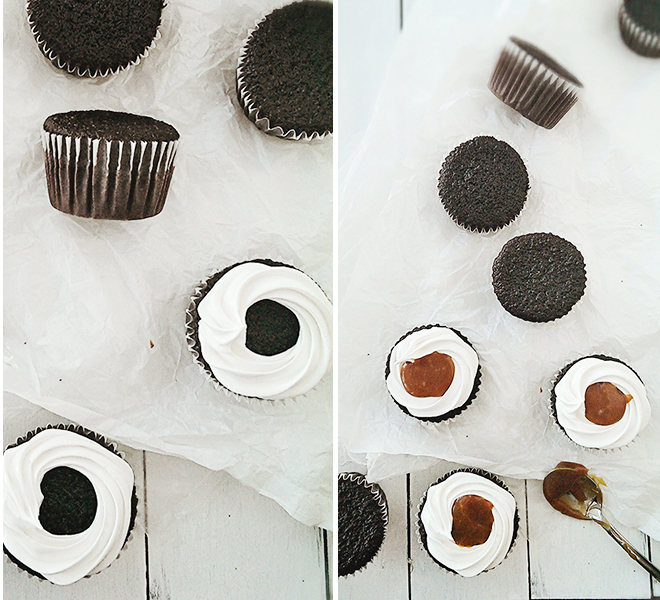 Bake 20-24 minutes, or until cupcakes feel slightly springy when you gently press their centres. Transfer cupcakes to wire racks to cool completely. Watch very closely as the syrup will go from clear to golden brown very quickly. As soon as it turns amber, remove saucepan from the heat. Working quickly and averting your face, whisk in the cream – holding whisk at arm’s length as the caramel will bubble up aggressively. Whisk in butter, salt and vanilla. Set aside to cool. The whole process from sugar to caramel takes only about 5 minutes on my stove. Combine egg whites, sugar, water, cream of tartar and salt in the top of a double boiler or in a heatproof bowl set overtop of a saucepan of simmering water. Using an electric mixer, beat on high for about 7 minutes – until it is shiny, voluminous and will hold nice peaks.